After the Vermont legislature adjourned early Friday morning, passing budget and property tax bills that Gov. 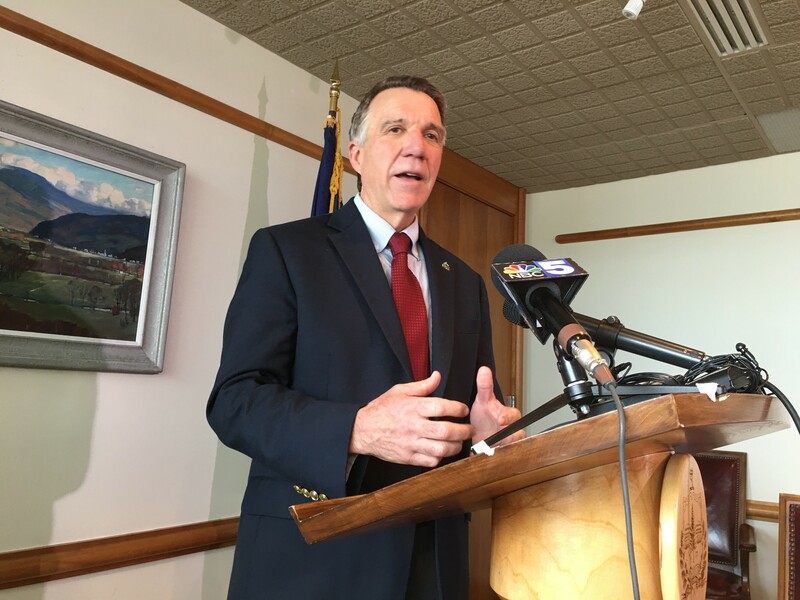 Phil Scott had promised to veto, the stage was set for a high-stakes confrontation. The House and Senate are scheduled for a two-day session June 21 and 22, less than ten days before the start of a new fiscal year. And if there is no agreement by July 1, the state government could shut down. The governor seemed to have the upper hand. The single unresolved issue was how to negotiate public school teacher health insurance: at the school board level, at the state level, or in some other way? The governor had seized the political high ground by repeatedly emphasizing the potential taxpayer savings — the fabled $26 million — that could be realized by changing the system. And then, at a Friday afternoon press conference, he strongly defended his position — but also acknowledged that he would rather lose on the issue than risk a government shutdown. During the press conference, Scott made a firm promise that there would be no shutdown. A reporter then asked what would happen if legislative Democrats refused to compromise. Which begs the question: What, then, has the last few weeks really been about? If he’s willing to fold unconditionally, why couldn’t he have accepted one of the Democrats’ offers that, honestly, weren’t that far from his position? So close … and yet so far apart that it’s worth not one but two vetoes, a veto override session perilously close to the new fiscal year, and perhaps an ultimate defeat on the issue? Not to mention that the savings will be lower in late June than they are right now, because more and more teacher contracts will have been settled under the current system. And yet, he believes this standoff is worthwhile. I asked Scott to identify the sticking point, and here’s what he said. The gist of this, I think, is that the governor has backed away from his demand for statewide negotiation of teacher contracts. But he wants some kind of change in the system that, in his mind, would guarantee maximum savings. Of course, all the savings in every plan are mere projections. Actual savings will depend on the outcome of teacher contract talks, not only about health care but also about salary and everything else. The problem with Scott’s position is that the legislature’s Democratic majority has a fundamental objection to changing the collective bargaining system on short notice. That won’t change between now and June 21. “In our conversations over the last few weeks with the governor, we said that the one thing our caucus couldn’t do was interfere in the processes happening right now, and change the rules of the game,” said House Speaker Mitzi Johnson (D-South Hero). It was at a negotiation session Thursday afternoon between Scott and top lawmakers that a deal very nearly came to pass. Scott sees the course of things very differently. Figuring out this Rashomon situation seems less relevant in light of the apparent bombshell dropped by the governor: All of his resoluteness may vanish into the mist as we approach July 1. There’s a political interpretation to this. If the governor vetoes the budget and property tax bills, he will satisfy his conservative base and the legislative Republicans who’ve been hoping for a showdown. If he then winds up getting less than he wants in the override session, he can blame his failure squarely on the Democrats and accuse them of choosing the teachers’ union over the taxpayer. Such calculation seems alien to what we think we know of the governor’s character. But right now, his admission that he’d rather cave than risk a shutdown seems to be either deft political jiu jitsu — or just plain dumb.